Recently, I started inventorying my brewing ingredients. In the process, I realized that I had ordered everything needed to make a Trappistes Rochefort 10 clone recipe I'd seen a while ago. I just didn't have the yeast. Then I remembered that I'd bought a few cans of Fast Pitch a while ago and hadn't used them. I also had a bottle of Rochefort 10 in the fridge. Time to grow my own yeast! I sanitized my one-liter flask and magnetic stirring bar. I sprayed Star San on the bottle of beer, the opener, and the lid of the Fast Pitch can and let them soak a little. Then I poured Fast Pitch into the flask and enough distilled water to hit the 1L mark. I opened the bottle of Rochefort 10, poured most of it into a glass for my own enjoyment, and left about a quarter-inch in the bottle. This leftover part I swirled vigorously until I could see no more yeast sediment in the bottom of the bottle. I tipped this "slurry" into the flask of Fast Pitch. To allow the starter to breathe, I stuffed paper towel into the top and did my best to ensure that it sealed the flask without blocking airflow completely. I turned on the stirrer and let it work. I've heard stories in years past that you "can't" culture yeast from a bottle shipped from Belgium. The theory goes that the yeast has been dormant too long and just doesn't have enough viable cells to culture. That certainly makes sense. On the other hand, a while ago I decided to brew a Gulden Draak clone and thought it would be good to use the actual yeast to do it. In that case, I had the yeast sediment from four bottles of the beer to work with. I was able to culture enough yeast through a three-stage starter to get my beer brewed. While it wasn't a perfect clone of Gulden Draak, it was a very good beer and shared many of the same characteristics. So, I know it can be done. Will it work with a can of Fast Pitch and the dregs from a single bottle of Rochefort? We'll see. A fair question to ask at this point is "Why culture up Rochefort yeast like this when you can buy White Labs' WLP530, which is basically the same thing?" The answer to that is simple. First and most importantly, it's an excuse to try Fast Pitch and write about it. Secondly, I'm on-call for work and I tend not to stray far from home those weeks, so I could get my yeast without leaving home. March 13 9:30pm: Dregs from Rochefort are pitched into the starter and the stirrer set in motion. March 14 6:00pm: I switched the stirrer off before going to work since it felt a little warm. When I came home, there was a nice thin layer of yeast in the bottom of the 1L flask, so I created a 64-ounce Fast Pitch starter and moved the yeast to a 1-gallon jar. I left the stirrer on overnight and turned it off the next morning. March 15 6:00pm: There's a nice thick layer of yeast in the bottom of the gallon jar now. The wort still smells pretty sugary, so I decided to leave it going for another day. I turned on the stirrer and let it run while I slept. March 18 7pm: I drained most of the wort out of the gallon jug I transferred it to, into a sanitized mason jar. Instead of the thin layer at the bottom of the Rochefort bottle, there is now a finger-thick layer of yeast across the bottom of the mason jar (which is wider than the Rochefort bottle). I'd say that was a successful use of the Fast Pitch wort. I wound up using three cans of Fast Pitch to grow a nice colony of yeast from the Rochefort bottle. That works out to around $7.50. Certainly, a bottle of White Labs WLP530 (purportedly the same yeast strain) would have been cheaper and faster. However, I wouldn't have the satisfaction of having brewed a Rochefort 10 clone with actual Rochefort yeast. I've also seen people suggest that using Malta Goya (a malt-based soft drink available in many supermarkets) would be just as effective and possibly cheaper than using Fast Pitch. It is worth noting that Malta Goya contains a lot of simple sugars which a forum discussion on Beer Advocate advised against using in a starter. A similar product called Malta Polar is also suggested as a starter wort because it lacks some of the sugars found in Malta Goya. I haven't tried either product, but I might someday out of curiosity. If I was creating a wort that used a lot of adjuncts, like a Belgian Tripel, I might consider using one of the malt soft drink products (Malta Goya or Malta Polar) as a starter wort material. I don't know that this would be any cheaper or better than Fast Pitch... so I'll probably only bother to do that if I run out of Fast Pitch and happen to stumble across one of the Malta products. Fast Pitch is probably a bit more expensive than mixing up your own wort from DME/LME and a few hops pellets. However, that also means boiling water, measuring, chilling, etc. This can take quite a while. 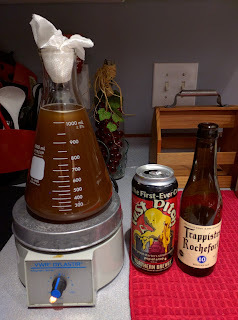 In this case, using fresh distilled water and Fast Pitch, combined with a magnetic stirrer and stir plate, enabled me to get the yeast starter working within about 2-3 minutes of opening the bottle of Rochefort 10. Given how little time I have available for brewing, that time savings and convenience is worth the extra couple of minutes and dollar or two. Your circumstances may vary. I had a number of malt extracts taking up space in my brewing ingredient area, and decided to see if I couldn't make an old dream come true... creating an ale with an alcohol content above 16%. This post is a chronicling of that experiment. My basic goal is a vaguely barleywine-style ale, with a strong fruity element. I'm thinking something perhaps dessert-like. My hope is that the Special B will impart a strong plum/raisin flavor to the beer, and that this will be complemented with the coffee/chocolate notes of the Chocolate Malt, and the bread-like notes of the Biscuit Malt to give the beer something of a dessert-like flavor profile. The unusually large hops additions (for me) were needed to balance out all the malt in this beer. The choice of Smaragd hops, honestly, was "because I had them" (a whole pound in fact). They are normally used as an aroma hop. They're described as having a predominantly fruity aroma with flowery tones. I thought that might work well with the Special B fruitiness. The hop is also said to "present subtle thyme, tarragon, clove, anise, and/or tobacco aroma" and one source (Nikobrew) said that it makes me consider how this hop could be used with darker, chocolate or roasted malt flavors." So I'm hoping that they're a good combo with the rest. We'll see. Chop a Campden tablet into fourths. Put one-fourth into the brew kettle along with 3 gallons of tap water. The tablet should remove the chlorine and chloramine from the water. Activate the yeast packets if you have not already done so. Measure all the ingredients and have them ready to go. I decided to try something different here. First, I dissolved all the malt extract into the water in the kettle. Then, I transferred this starting wort into The Grainfather. This raised the wort volume to just over 4 gallons. In a mesh hop spider I placed all the specialty grains to steep. This was set in the existing wort, which had been heated to 150F. The grains steeped at 150F for 30 minutes. The grains were removed from the wort and the hop spider cleaned out. As the wort worked toward a boil, I put the cleaned hop spider into the kettle and suspended it with a bungee cord as it couldn't touch the wort from the rim of the kettle. Before the boil, I added 2.5 ounces of Smaragd hops pellets into the spider. When the wort reached a boil, I started the boil timer for 60 minutes. With 30 minutes left, I added 2.5 ounces of Smaragd hops pellets into the spider. With 15 minutes left, I added the Whirlfloc tablet. With 10 minutes left, I added the last 2 ounces of Smaragd pellets and the yeast nutrient. With about 7 minutes left, I began recirculating wort through the counter flow chiller to sterilize it for later use. At the end of the boil, I removed the hop spider and turned off the heat. I turned on the cold water to the counter flow chiller, put the outlet line into the sanitized fermenter, and turned on the pump. The wort arrived in the fermenter at 68F from the chiller. I inserted my oxygen stone and pumped pure oxygen into the wort for 120 seconds to give the yeast its best possible chance of success. I pitched the two packets of yeast into the fermenter, attached a blow off tube into a jug of Star San. I attached a fermwap heater to the fermenter, connected this to an Inkbird temperature controller, and inserted the probe into my fermeter's thermowell. Using a known accurate thermometer, I calibrated the controller's temperature reading to match so that it would keep the beer at the right temperature. I set the fermentation temperature to 74F and let the controller raise the wort up to that temperature. I took a refractometer reading and got 31 Brix or 1.136 SG. It was almost off my refractometer's scale. Hold the fermenter at no less than 74F. When the krausen starts to drop, feed the yeast 32 ounces of water with a pound of corn sugar to keep it going. Check alcohol levels and do a taste test. Adjust beer if needed or prepare to bottle. Bottle with CBC-1 yeast and boiled water with corn sugar. Those of you who have access to brewing software like QBrew, BeerSmith, or Beer Tools Pro will note that the software will calculate the potential ABV of this brew to 12.2%. The Brewer's Friend calculator actually gives some different information. They claim that the "Alternate" calculation works better for beers with a higher gravity. That calculator estimates that this beer could exceed 19%. I also took three large bourbon barrel chunks and began soaking them with bourbon to make a tea that I can add during the bottling process to give the beer a barrel-aged flavor. I'll only do that if it seems to make sense with the beer's flavor profile. About 12 hours after pitching the yeast, I saw no activity in the blow-off vessel. I carefully looked inside the fermenter and saw that a small colony of yeast was starting to grow on top of the beer. At about the 24-hour mark, I checked again. This time there was a nice thick krausen. I was satisfied at this point that the yeast was alive and well, and left it alone. Update 3/26/2016: After 2 weeks on the primary yeast cake, I decided to move it to a secondary fermenter to clean it up a little. Samples taken to read gravity were showing about 27 Brix, down from the original 33 Brix measurement. Tastes of these samples were bitter and felt "pulpy" or "gritty" so I thought transferring to a secondary might help some of the solids settle out. I removed the blow-off tube and installed an S-shaped airlock. An hour or so later, I noticed the airlock bubbling regularly, so I am confident the yeast is still in there doing its job. The beer had a very strong acetone smell to it, possibly from high fermentation temps. Depending on the cause of the aroma (ethyl acetate vs. fusel alcohols) it may clear up in extended conditioning. We'll see. Interesting note - this beer had one of the largest yeast cakes in the bottom I've ever had. It filled almost the entire conical section in the bottom of my SS Brewing Technologies Brewmaster Bucket fermenter. Yeast Viability or Stuck Fermentation: My yeast was 5 months old. This meant it wasn't very viable. There was a real chance it might not take off in such a high-gravity environment. My fallback position was to rehydrate some CBC-1 bottle conditioning yest (which can tolerate 16% ABV) and pitch that if fermentation hadn't started in 24 hours. If that still didn't take off, I'd pitch champagne yeast or wine yeast, which I have on hand. Similarly, if I experienced a stuck fermentation before final gravity, I'd do the same to rouse the yeast, plus raise the temp. Finished Beer Too Sweet: My initial calculation in BeerSmith showed this to be a 65 IBU beer and have a 0.5 bitterness ratio, which would be about ideal for my taste. However, I didn't think about how the sugar additions would dilute the beer's bitterness. If the modified calculations are correct, the final ratio for this beer could be as low as 0.284 which is on the sweeter side. With the addition of a high alcohol content, which sometimes lends sweetness, this could make the finished beer too sugary. To counteract this, I'll take two quarts of water and boil an ounce of Smaragd hops in that to make a hop tea. I'll gradually add this to the bottling bucket and stir it to adjust the bitterness to (hopefully) a balanced level. Finished Beer Too Yeasty: It's possible I'll need to add yeast multiple times to get this beer fermented and carbonated. All that yeast carries some risks with it. The worst here is that autolysis, given the age of my yeast, could rear its ugly head. Another is just an overly yeasty aroma and flavor. To reduce the risk of autolysis, my plan will be to get the beer off the main yeast mass as soon as the gravity gets close to the target. I may even transfer it to a third fermenter before I'm done. I'll also plan to give it a long period of conditioning to give the yeast time to settle out. We'll see how this turns out in a few weeks, and I'll come back to update this post. Update 3/26/2016: The chance of this beer being too sweet ought to be incredibly low. When I've tasted samples as I've done gravity checks, the beer has always tasted somewhat bitter. If it's undrinkably bitter at the end of the process, which is possible but unlikely, I do have a beer in bottles that turned out too sweet. I could use it to balance this one if necessary. Update 4/3/2016: The gravity reading on a refractomteter has dropped from 27 to 25 Brix since my reading approximately 8 days ago. There is still regular activity out of the airlock, so I am satisfied that the yeast is in there doing its job. A taste test revealed that the bitterness has dropped quite a bit on the beer, which I was glad to see. It's now mildly sweet. Best guess is that the alcohol content is only up to 6.4% at this point. The yeast has a long way to go if it's going to hit my 8 Brix target final gravity. Update 4/17/2016: The fermenter is still bubbling through the airlock periodically, so the yeast still alive and well. I'm planning to take a hydrometer reading soon to get a better idea how it's progressing since it's not possible to trust a refractometer very well in the presence of alcohol. I've probably ordered brewing supplies from most of the more well-known shops on the Internet, and I've bought products from all the local homebrew shops as well. I've gotten kits from several places and ordered individual ingredients to make several more recipes. Until this week, I hadn't tried any kits from Great Fermentations. 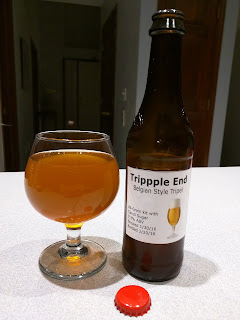 After reading that their Tripppel End kit is "reminiscent of Unibroue's La Fin Du Monde" (one of my favorite Tripel style beers), I ordered it. I received a discount through a sale they were having at the time, but the kit's normal price is $39.99 in all-grain format. The kit arrives as a plastic bag containing the grains, which are pre-measured and crushed. With the bag of grains comes a set of instructions and four ounces of hops. I looked at that and thought, "Either these are weak hops or this is a lot more bitter than La Fin Du Monde..."
My modified recipe drops the IBUs to 21.9, which is closer to Unibroue's 19. It's worth noting that my yeast packages were both past their prime. At this point I mis-read the instructions and added the 2 pounds of Candi Sugar and made sure they dissolved. This was supposed to happen 10 minutes from the end of the boil. Oh well. With 22 minutes left in the boil, add the Irish Moss, the second ounce of Tettnang, and the yeast nutrient. The recipe called for half the hops to be added at 30 minutes and half at 15, but the Grainfather app's timer didn't go off at the 30-minute mark and I didn't realize this until the 22-minute mark. This allowed me to keep the IBUs up, and in fact increased them slightly to approximately 23.4. At 0 minutes left, I checked the kettle volume and it was approximately a half-gallon higher than it should have been. I removed the hops bags to prevent over-bittering the beer and continued the boil until the volume reached the 5-gallon mark. My pre-boil gravity came out at 62 instead of the expected 75, but my volume was also above the estimated 6.27 gallons in BeerSmith. At end end of the boil, chill the wort to 64-72F using the counter flow chiller and pump into the fermenter. Oxygenate for 60 seconds with pure oxygen. Great Fermentations suggests a primary fermentation of 2-3 weeks at 64-72F. A secondary fermentation of 1-2 weeks can be used to improve clarity and reduce sediment if desired. Their web site says that the beer "shows promise a month after brewing but really shines after 45-60 days in the bottle." I fermented the beer in a plastic bucket primary fermenter for three weeks. My basement's ambient temperature is 64-65F, and it seems to have kept the beer close to the target range without my having to apply heat or cooling. Since tripels aren't typically very bright clear beers, I chose not to transfer it to a secondary. I bottled it three weeks after pitching, using CBC-1 bottle conditioning yeast and carbonation drops for priming sugar. Yield was a 64-ounce growler (which was force carbonated) and 34 bottles. Approximately 12 of the bottles were 22-ounce and the other 22 were 12-ounce. The folks at Great Fermentations apparently mill their grains perfectly for The Grainfather. I've never had a mash and sparge go so smoothly with The Grainfather. It saved me quite a bit of brewing time, especially when combined with The Graincoat accessory that helped the device heat water and wort much faster. I'll definitely consider ordering more from these folks. I could have sworn I read in the instructions that I should add the candi sugar at the start of the boil, but later realized that this was for a different Tripel recipe I was looking at. Lesson learned here is to make sure you read and re-read the instruction sheet (for the kit you're using). I also learned after transferring this batch to the fermenter that I have been doing something wrong with The Grainfather from the beginning. I've been using a sparge water calculation intended for a six-gallon batch when creating a five-gallon batch. I've also not allowed the grain to mash for longer than 60 minutes, which may be why I had such a low gravity. I'll adjust this in future batches. In addition, I've learned that The Grainfather's mash formula is often on the thinner end, which warrants doing a longer mash to ensure full conversion. The beer came out a bit more amber than yellow or gold, which isn't quite in keeping with the Tripels I've had from Belgium. On the other hand, putting the candi sugar in at the start of the boil may have contributed to that. It's relatively clear but there is some haze to it. As you can see in the image at the left, although it did carbonate somewhat, carbonation is minimal and what little head there is doesn't last long or leave any lacing. This is a problem I've had with a lot of my Belgian-style beers. I think it tends to be a problem when I use carbonation drops instead of priming sugar to prime the beer before bottling. The aroma of the beer is a fruity and slightly sweet. In this respect, it's exactly like other tripels I've had and enjoyed. The flavor is very slightly sweet, with some orange and orange peel to it (despite none being added), and with a hint of roasted grain at the very end. The hops balance, to my taste, is ideal. 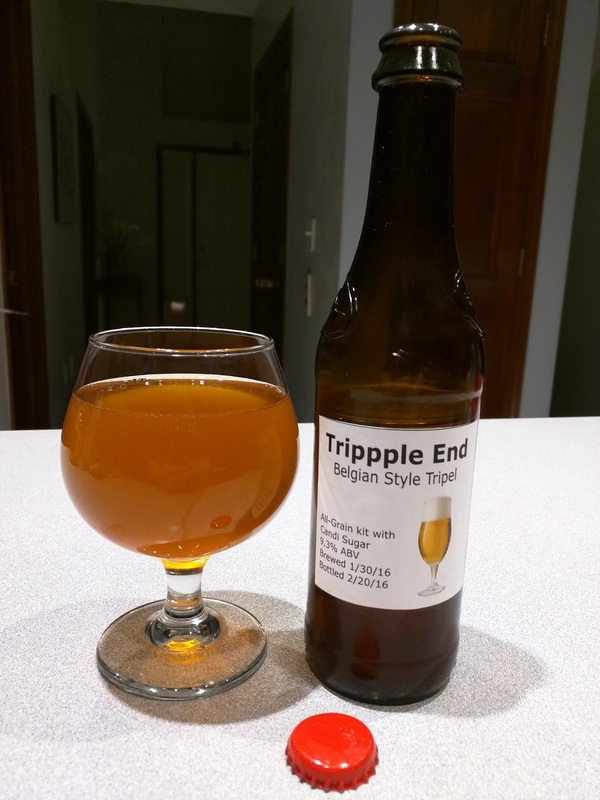 There is enough bitterness to keep it from being cloying, but not so much that it tastes like a hop-forward tripel. I'm very glad that I cut the hops bill in half on this beer. With half the provided hops, the beer is more like Unibroue's La Fin Du Monde than I suspect it would have been with the full hops load. If you're not a fan of hop-forward beers, it's a good idea to invest in Beer Tools Pro or BeerSmith (or even the free QBrew) software to double-check the recipes you use. It seems that a lot of recipes were created by folks who love to generously hop every beer they brew, even if that makes the beer more like an IPA and less like the style it's purported to be. If that's your thing, I've got no problem with it. But I prefer my beers to be more balanced or malt-forward than hop-forward. I will probably brew this beer again. Even with the mashing issues, it has a nice flavor, a good fruity Belgian yeast character, and isn't too dry or too bitter. It's one of the better Tripels I've made. 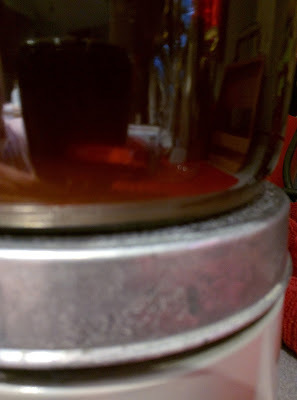 I had pretty well mastered extract brewing in late 2014. My recipes typically came out right at the target gravity and volume, with little or no variance. My beers were good, and I had only ever tossed two batches, which were made without an actual recipe and turned out so sweet as to be undrinkable. I received iMake's The Grainfather RIMS brewing system in August 2015 as part of the Kickstarter. In September, I started using it. In retrospect, this was a lot to change at once. I went from extract to all-grain. I swapped out my kettle, immersion chiller, and other equipment for The Grainfather, all-grain brewing, and all-new recipes. I did this without any help or guidance from others, apart from my own reading. It's kind of surprising that I haven't had to toss a single Grainfather-made batch. A recurring problem for me was that my final post-boil volume and gravity were rarely close to my recipes. If my recipe was supposed to yield 5 gallons at 1.045 gravity, I'd end up with 5.5 gallons at 1.038 or 1.040. Even when I boiled down to the target volume, my gravity was usually low. I'd been using the default sparge water calculation in the manual. This meant that I was calculating sparge water based on a six-gallon batch instead of five gallons. Adjusting the calculation for a five-gallon batch got me closer to the final volume target. I didn't know enough about enzymes and their role in mashing. In Palmer's book, I learned that the optimum balance of mash water to grain for a 60-minute mash is 1.5 quarts of water per pound of grain in the mash. The Grainfather's figure results in a thinner mash that needs more time to convert starch to sugar. The adjusted sparge water calculation reduced pre-boil volume by one gallon. In a few cases, my volumes were still a little high near the end of the boil. In these cases, I removed the hops bags (to prevent over-bittering) and continued boiling until I hit the target. Adding malt extract near the end of the boil to increase the gravity is also an option. That last item (adding extract) carries a couple of caveats. You should probably do this with at least 15 minutes left in the boil to ensure that the extract is boiled enough to sanitize it. A second caveat is that if you're adding liquid malt extract, I've found that this tends to fall to the bottom of the Grainfather kettle and trigger its thermal cut-out switch. This circuit-breaker-like device has to be reset by reaching underneath the Grainfather and pressing it in. That can be risky with a full kettle of wort. You're much better off using dry malt extract, which tends to float on the surface of the wort until it dissolves. For my most-recent brew, a Blonde Ale, reducing the sparge water amount by a gallon allowed me to hit the post-boil volume on the mark. Extending the mash time from 60 minutes to 90 minutes seemed to solve the gravity issue for that batch, which had a slightly higher pre-boil gravity and an on-target final gravity. I have yet to have had to use malt extract since making those adjustments, but I keep some on-hand for just that contingency.